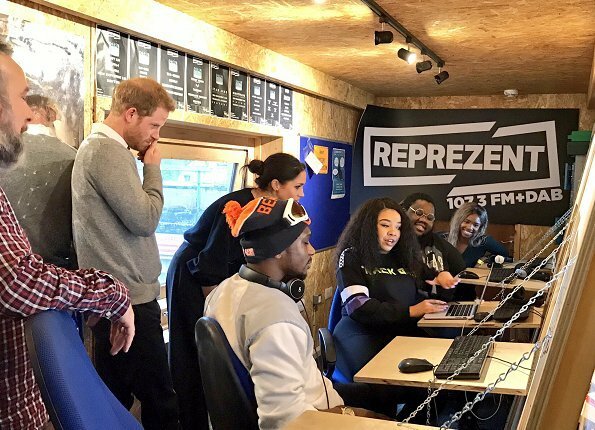 Prince Harry and Meghan Markle visited Reprezent 107.3FM in Brixton in order to see the radio channel's activities which support young people with creative trainings on radio broadcasting and to receive information about media usage models that cause a social impact. Reprezent FM is a radio station that focuses on the problems of young people and that is led by young people. Reprezent FM provides a platform for young people where they show their skills and discuss social issues that affect them. OMG, what´s happend with her hair? It looks like she´s going to a supermarket. It seems to be an official date. Kate would never be appear so unstyled on an offical date. I like the overall look, but the hair in her face, and the scarf that looked like it was going to swallow her could be tweaked. She'll figure it out, no doubt. Well you have to remember African Americans have very unique hair. They have very different hair. It is not Caucasian and it is not African! It is Extremely fragile which is why it is always in a bun. They call them protective hair styles google it. Because the hair is so fragile it can only be straighten or styled once a month . Other wise you are looking at one inch of split ends every time it is blow-dried or and flat ironed. Not to mention inches and inches of hair being melted off by the flat iron. That is why a lot of African American women wear natural hair. It is too much of a headache to style hair everyday. She may have to just get a lot of high quality wigs or be doomed to short hair due the heat and styling damage. As a black woman living in America, I am just aghast. The nonsense some people will come up with. I NEVER wear my hair in a bun. Neither does my sister. Thanks for the laugh! Simple and understated which is perfect for this visit. She's doing well. Agree! She was totally appropriate. Classic and chic! I am so excited about them and her style. Ppl need to NOT compare her to Kate. They have different roles and taste. I love Kate but I for one do not a carbon copy of her. 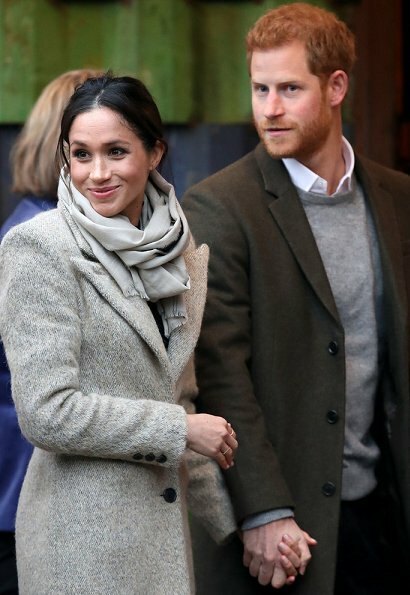 Meghan is her own person and very stylish. She looked great! She's an asset to DA FIRM.....modern times are arriving! She is doing great! Lovely Meghan! I was disappointed by the outfit. The shoes are great but the scarf is too casual and gives her a rather messy look. I don't mind casual--but I prefer groomed casual and the hair looks too messy. I think the overall effect is that of being overwhelmed by her clothes. The slacks are too floppy and a tad too long, the coat is bulging in places because the sweater inside has too much volume at the sleeves. The overall look is too much like someone who bundled up to run a quick errand. Not a disaster (except for the hair) but not polished enough for an official royal outing. Contrairement à vous, j'aime son style. La sortie est peut-être formelle mais dans un contexte quasi informel, donc pour moi, la tenue est parfaite. La rencontre était avec des jeunes, je ne l'imagine donc pas guindée et dans le très chic. Elle est décontractée juste comme il le faut. 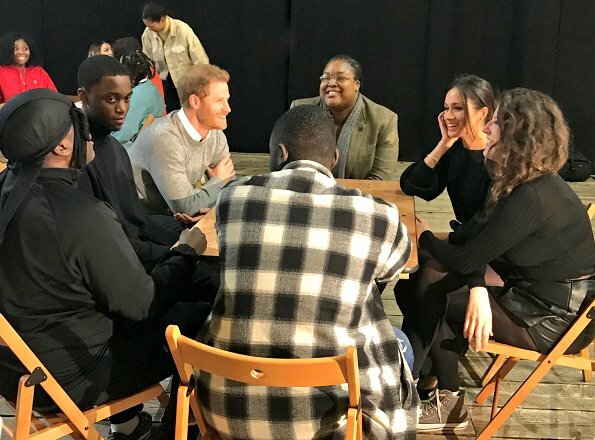 La tenue du prince Harry va très bien avec la sienne. Pour ce qui est des cheveux, je suis un peu d'accord avec vous mais d'un autre côté, elle ne semble pas avoir l'épaisseur de cheveux comme ceux de Kate. Ils sont peut-être plus difficile à coiffer. Mais pour moi, c'est un détail négligeable dans le cas présent. Je pense qu'elle a un plus grand potentiel pour s'habiller avec désinvolture mais bien que ce qui est montré ici mais à la fin nous répondons selon nos goûts et nos attentes. Je ne pense pas que ce soit un désastre, seulement un peu décevant. They are dressed in coordinating styles - casual and comfortable. This is ideal for them and will probably be well received by the British people. I’m sure they will put on medals and diamonds for the Royal events. I think she hit just the right note for this particular event. It was very casual in an informal environment. A super-smart bandbox outfit would have been too much. 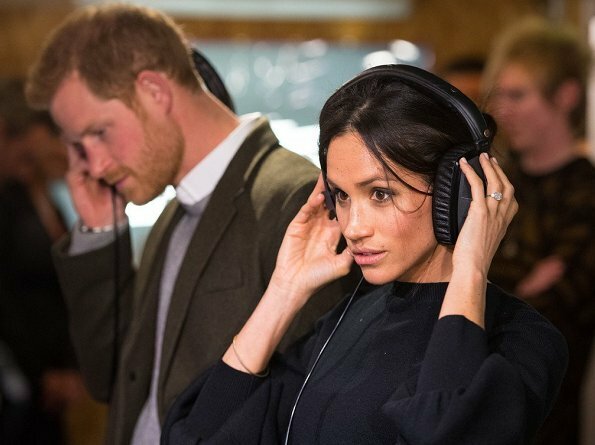 Meghan was taking headphones on and off at the station, which mussed up her hair. I doubt anyone at the event minded based on their affect and expressions. People in the crowd were hugging her. And it's cold and windy. Her smile and laugh are infectious and Harry looks the happiest I have ever seen him. His face looks transformed. @Pine. I so agree with you. I have never seen Harry so happy. And I had often pity with him to always do his duties on his own. He was so often just the third wheel with William and Catherine. It seems he has found his soulmate and I wish these two only the best. Agree Pine and Beth! They make me smile! I see great things coming! They do small things with great love. I´m looking forward to their next Event. What a lovely way of describing it! What a smart modern couple! Love it! I am so looking forward to see more of them. 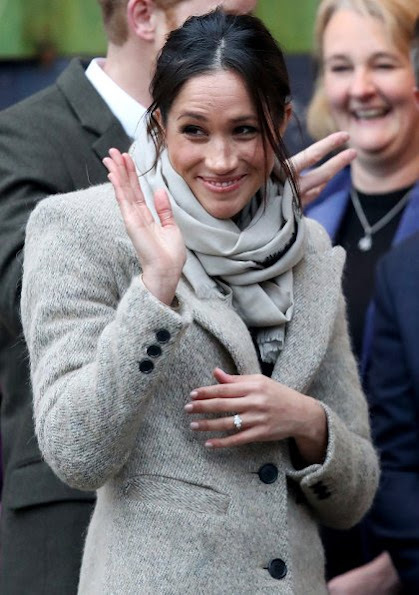 Meghan is dressed perfectly for the event. 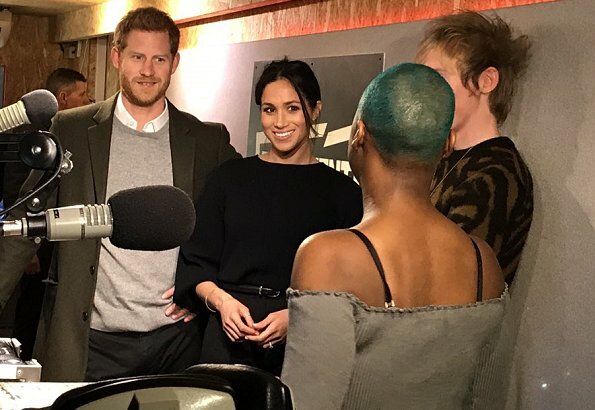 For those who critisize her, this is not a formal State Event, they are visiting a radio station with focus on young people. They both hit the point! And for her hair - this is what you call a casual updo - again totally okay for the occasion. It would not be okay for a formal event. But it still is a hairstyle and not just snatching up the hair with a scrunchy, as we saw it quite often with Stéphanie. This is not the same. Same for her trousers. 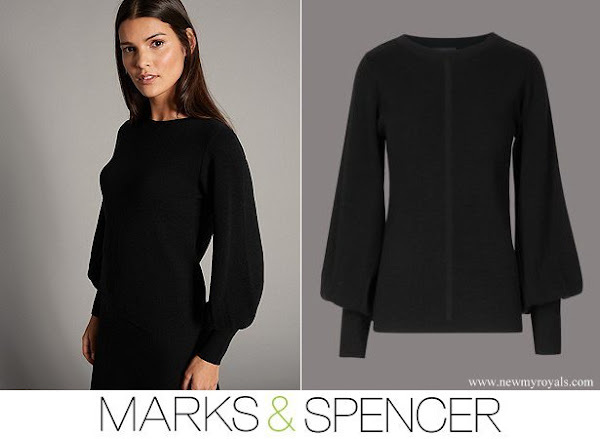 Meghan wears perfectly fitted flared pants well combined in style and color with the Marks & Spencer Jumper. Whereas Stéphanie wears so often simply ill fitting too large pants with to too small tops. Again this is not the same. Well said(= I enjoyed the entire look and swiftly began ironing my wide leg pants because the look is too good-I am incorporating this in my rotation STAT! 'The hair...the hair, she forgot to comb her hair'. Is this really the only thing you can remark?! She is so charming and radiant and happy with Harry. Still talking about not having 'combed her hair'. Poor you! Well, she was continually having to push it out of her face - so it was quite noticeable. Love the 'messy bun' look - she just needs to work on the front so its not a problem. Agree to the Maxima 2. Hair in the face is just messy. She and Kate are constantly pushing their hair out of their faces. 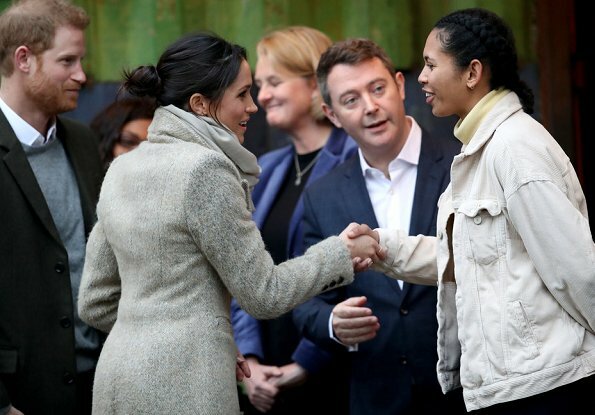 Meghan's hair is not quite as messy as Maxima's but I find it distracting and disrespectful to her hosts, particularly in photos 6 and 8. She has to constantly push it out of her face. Completely agree with Beth. Harry is not William. And Meghan is not Kate. They have very different roles and I think their outreach will be very different. And that's a good thing. 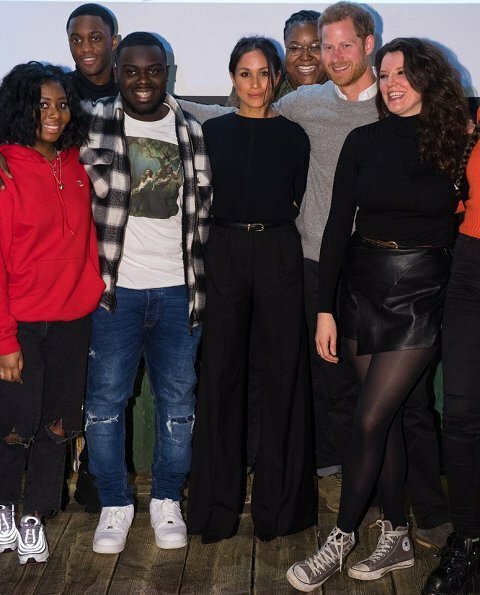 I really like Meghan's style for this event, sweater and trousers are perfect on her and she choose nice matching shoes. She looks modern and chic only her hair is a bit ruinning this perfection. Mein Gott, ist das eine Süße !! Nicht nur bildhübsch, sondern mit soo viel Charme und Warmherzigkeit - ihre ganze Körpersprache leuchtet quasi. Und Harry wirkt glatt 20 cm größer vor Liebe und Stolz auf seine tolle Frau. Das sehe ich genauso, Nanni! Beide sind starke Persönlichkeiten, aber ich glaube zusammen sind sie unschlagbar. Ich freue mich für sie und freue mich auf die Hochzeitsfotos. Un air casual chic, très élégante, à mon avis. Mais surtout, il me semble qu'elle est très simple, affectueux, gentil comme on peut le voir. Such a lovely love-birds, makes me happy to look at these pics. I think she looks perfect for the event. Seriously... she is just gorgeous. My sentiments exactly. Royal doesn’t mean stiff. Natural warmth, no unnecessary pretentiousness- this is what I see when I look at these two. 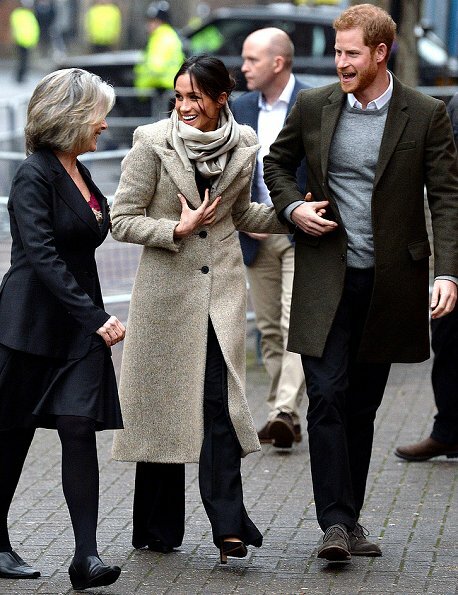 Personally I like Meghan's outfit! I am thrilled that she is wearing slack/pants/trousers or whatever anyone want to call them! 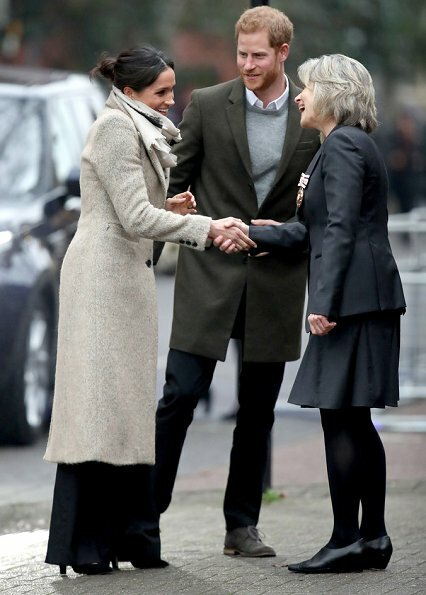 It is about time the British Royal Family got with the times, it is after all the 21st century. 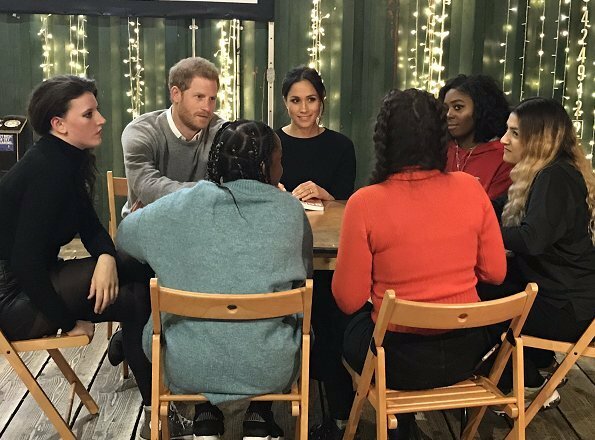 As for Meghan's hair, pretty and casual. 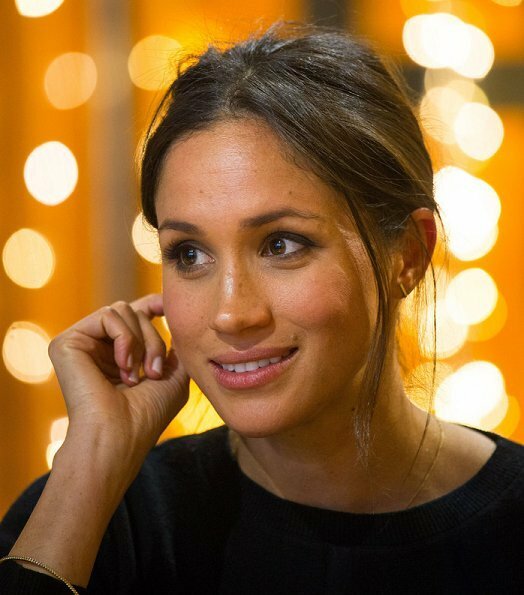 I think Meghan will be a breath of fresh air, just like Prince Harry.